PCC CLIMB Center with PCC WorkSource Willow Creek launched a Certified Production Technician (CPT) program. Poly-Cast, a manufacturing company in Tigard recently wrote an article about their involvment in the program. 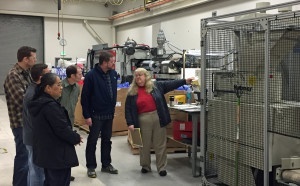 "On February 18, Poly-Cast Inc. hosted a group of students from Portland Community College to take part in a tour and presentation about the skills and talents needed to work with manufacturing companies like Poly-Cast. The CPT program at PCC enables students to receive the training necessary for today’s modern manufacturing jobs, which will allow them to secure jobs with local companies such as Poly-Cast." Read the full article posted on Poly-Cast.